Roleplaying games and their genres run in cycles, typically drawing from other sources such as events and other media. For example, both Godlike: Superhero Roleplaying in a World on Fire, 1936-1946 and Weird Wars: Weird War II appeared following the sixtieth anniversary of the USA’s entry into World War Two, and Skull & Bones and Pirates of the Spanish Main appeared following the release of the film, Pirates of the Caribbean. If for the last fifteen years or so, the trend in roleplaying has been the nostalgia of the Old School Renaissance, there is a whole new trend in 2017—and it is just as nostalgic. It is for the 1980s and specifically for being kids in the 1980s—and it is all due to one television series, Stranger Things. What this nostalgia—and indeed, Stranger Things—offers for a great many is a chance to revisit a familiar time, a time which was their childhood. For many, this will have a certain emotional resonance, and this is reflected in Tales from the Loop. 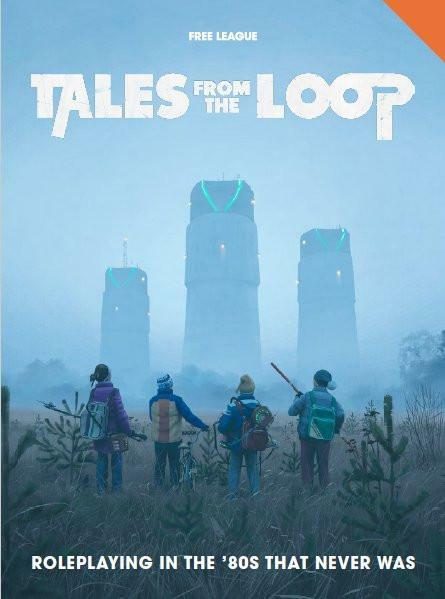 Released in English by Modiphius Entertainment following a successful Kickstarter campaign, Tales from the Loop – Roleplaying in the '80s That Never Was is based on the paintings of Simon Stålenhag. These depict the rural small-town Sweden of the 1980s, an alternate one, for its streets, woods and fields, and skies and seas are populated by robots, gravitic tractors and freighters, strange sensor devices, and even creatures from the long past. To the inhabitants of this landscape, this is all perfectly normal—at least to the adults. To the children of this landscape, this technology is a thing of fascination, of wonderment, and of the strangeness that often only they can see. In Tales from the Loop, it is often this technology that is the cause of the adventures that the children—the player characters—will have away from their mundane lives at home and at school. Specifically, Tales from the Loop is set on Mälaröarna, the islands of Lake Mälaren, which lies to the west of Stockholm. This is the site of the Facility for Research in High Energy Physics—or ‘The Loop’—the world’s largest particle accelerator, constructed and run by the government agency, Riksenergi. In addition, the Iwasaka corporation of Japan has perfected self-balancing machines, leading to the deployment of robots in the military, security, industrial, and civilian sectors and these robots are employed throughout the Loop and its surrounds. Meanwhile, the skies are filled with ‘magnetrine vessels’, freighters and slow liners whose engines repel against the Earth’s magnetic field, an effect only possible in northern latitudes. There are notes detailing the particulars of life in Sweden in the 1980s, but the culture is radically different—especially in terms of its (almost Socialist) government—to that of the USA and so Tales of the Loop includes an American counterpart to The Loop, this time located under Boulder City in the Mojave Desert in Nevada, near the Hoover Dam. Here the particle accelerator is operated by the Department of Advanced Research into Technology and there is an extensive exchange programme in terms of personnel and knowledge between the staff of both ‘loops’. Similarly, the description of Boulder City and its Loop include plenty of notes on life in the 1980s and as much as the two cultures are different, there are plenty of similarities between the two. In Tales of the Loop, the players take the role of Kids aged between ten and fifteen. They play archetypes—Bookworm, Computer Geek, Hick, Jock, Popular Kid, Rocker, Troublemaker, and Weirdo—who have two lives. In one they go to school, do homework, spend—not always happy—time with their family, and so on. In the other, they explore the landscape and its ‘mysteries’ around them with their friends. As thrilling and as fraught with danger as these mysteries are, the adults will never believe the children and the children will never actually die—although they can be hurt. Or as Tales from the Loop defines it, suffer from Conditions. In the main, this is an emotional hurt rather than a physical one, although it possible to be injured or broken. When this happens, a Kid can rely upon his friends, but he can also turn to a particular parent, teacher, neighbour, or other adult for comfort, care, and support. This will restore their emotional state. Each archetype provides a Kid with three key skills, plus and options in terms of iconic items, problems, drives, pride, relationships to the other kids and NPCs, and an anchor. For example, the key skills for the Popular Kid are Contact, Charm, and Lead. An Iconic Item might be a pack of chewing gum or a diary with juicy secrets, the problem a crazy aunt living in the family basement or a parent having an illicit affair, the drive a hatred of secrets or to get away from being so popular, and the pride being that everyone likes him or knowing everything about anyone. A relationship with another Kid might be that he knows he is love with him or she is freaky and I like it, whilst a relationship with an NPC might be that a new girl has appeared at the Wildlife club and she is scary or that the school janitor hates him, but he knows that he is up to something. Lastly, an anchor, the source of emotional care and support might be an older sibling or a famous friend of the family. To create a Kid, a player first chooses an archetype and then decides on his age, between ten and fifteen years of age—a Kid essentially retires from investigating Mysteries once past the age of fifteen. A Kid’s age determines how many points a player has to assign to his attributes, although the older a Kid is, the fewer Luck points he will have to spend on rerolls. A player has ten points to assign to his Kid’s skills. The maximum is three for the archetype’s key skills and one for other skills. The player then chooses the Kid’s Iconic Item, Problem, Drive, Pride, Relationships, and Anchor from those listed for the archetype, or makes them up himself. Our sample character is Barbara, a bespectacled redhead with a twin brother who is a Computer Geek. She prefers her books. She and her brother are rivals and from a one parent family; her father having died. Neither likes to say who the older is—only who is cleverer. She is from a game I played in at Spaghetti ConJunction 1b on Saturday, October 21st, 2017. The game was set on the outskirts of Derby and involved the theft of the full size Big Trak military vehicle. Problem: Nobody tells me how my dad died. Drive: I want to find answers to the big questions in life. Relationships: He is my competitor (twin brother); Mary, the school librarian, was my friend until she disappeared. I am sure that the school janitor knows more than he is saying. The creation process is collaborative, each player creating a character and then as relationships are decided upon, forging links between the members of the gang. In addition, each Kid has a favourite song and together the Kids have a Hideout, a place which the NPCs cannot find on their own and where the Game Master cannot put any of them in Trouble. It also works as a possible place to recover from Conditions if the Kids are mentally or physically close with each other. Lastly, the Game Master gets to ask the players some questions about their Kids and about their gang. These add flavour and detail to further define everyone. Mechanically, Tales from the Loop is very simple. The roleplaying game uses a simplified version of the mechanics to be found in Mutant: Year Zero – Roleplaying at the End of Days, also from the same publisher, to handle what it calls Trouble. To undertake an action, whether in Trouble or not, for example, slipping out of the grasp of a bully or working out what a machine does, a player adds the values of the relevant attribute and skills together and rolls that number of six-sided dice. Use of an appropriate Iconic Item will add two dice to the pool. Each six rolled counts as a success. In the main, a player only needs to roll one six to succeed. Tasks needing two or three successes are rare and represent almost impossible situations, though some situations, such as overcoming the final situation or bad guy, might require every Kid to get involved and roll successes. Excess successes can be used to purchase effects, which the player can decide upon with the Game Master. Failing a task can lead to a Kid suffering a Condition—Upset, Scared, Exhausted, Injured, or Broken. For example, a Kid might be Upset if he fails to avoid the bullies and their taunts, or Scared when hiding from a robot that is acting strangely. If a roll is failed, a player has two choices, spending a point of Luck to reroll the task or pushing the roll. Doing the latter though will inflict a Condition on a Kid. For each Condition a Kid has, his player rolls one less die. If a Kid has the Condition of Broken, then he cannot deal with any Trouble without failing. Recovering from Conditions requires spending time with a Kid’s Anchor or with another Kid in the Hideout and roleplaying the scene out. A Mystery, as Tales from the Loop calls its scenarios, can be divided into five phases—‘Introducing the Kids’, ‘Introducing the Mystery’, ‘Solving the Mystery’, ‘Showdown’, ‘Aftermath’, and ‘Change’. There is no limit to the scenes which can be run during each of these phases, but the first and fifth, ‘Introducing the Kids’ and ‘Aftermath’ are always grounded in the reality of the Kids’ lives at home. Their mundane nature counterpoints the reality of the Mystery and the secrets of the landscape around them. The sixth phase, ‘Change’, is really after the scenario, when the players have the chance to reflect on the Mystery and what their Kids did, spend any Experience Points and so on. The advice for the Game Master running Mysteries is excellent, covering mood, nostalgia, and getting the players involved in setting up scenes for the Kids as well as the Game Master. Tales from the Loop includes six minor Mystery outlines that the Game Master can develop into fuller Mysteries as ‘The Four Sciences of Mad Science’, a four-part campaign. Together they provide hours and hours of play and really delve into the weirdness in and around the Loop. All of the Mysteries are set in Sweden, but notes are included to adapt them to the USA. Phsyically, Tales from the Loop is a sturdy hardback, written in a light and engaging style. Of course, it benefits from and features the excellent artwork of Simon Stålenhag, which really highlights how the technology of the Loop has imposed itself on the landscape. One oddity of the artwork is that the children depicted are always looking into the picture and at the technology, never out as they alone are fascinated by it. The layout of the book is interesting in that it feels very much more like an architectural magazine of the period. Tales from the Loop is any number of Spielberg-style movies from the 1980s, but is also any number of films from the Children’s Film Foundation also. It is about how amazing these adventures and solving the Mysteries in and around the Loop are, but always balanced by the ordinary, often emotionally fraught the lives of the Kids are away from their adventures. The importance of emotion in this game and how the Kids feel and are affected by their situation is for a certain audience—the gamers who were teenagers in the 1980s—further exacerbated because this is when they grew up, when their family situation would have been like it is depicted in Tales from the Loop, when they could have had these adventures and solved these Mysteries, and when they would have encountered many of items, songs, ordinary technologies, and so on, for the first time. So in effect there is both an emotional and nostalgic underpinning to the roleplaying and for many of its players, this is what they will be drawing upon in playing Tales from the Loop. This does not mean that players of other ages cannot play Tales from the Loop, but for some players it will have a certain emotional resonance. As to the horror of Tales from the Loop, it is twofold. One is the emotional horror, both in coming face to face with the dangers of the Mysteries in and around the Loop and in dealing the tensions and little things of mundane life—family and otherwise. The other is scientific horror, essentially the side effects and unexpected results of the research carried out of the Loop. Although very much packaged as a traditional roleplaying book, Tales from the Loop is really more of an ‘Indie’ roleplaying game, a storytelling game with its simpler mechanics and exploration of emotional nostalgia. Yet the combination of the repackaging with its theme and genre mean that this roleplaying game and its storytelling mechanics are wholly accessible and acceptable. Above all though, its exploration of emotional and scientific investigative horror in playing a Kid once again give Tales from the Loop – Roleplaying in the '80s That Never Was a surprisingly emotional heft which few roleplaying games achieve, let alone strive for.